There are many questions as to when a newly installed deck should be stained. Some stain manufacturers suggest you should wait 3-12 months to let the wood dry while others say to stain the deck right away. The answer can be both just as long as you prep the new wood properly for an application of the stain. We are going to explain both scenarios and the proper steps to take. Most common suggestion by the manufacturer. New wood is suggested to dry since it has a high moisture content. This reduces the stains ability to penetrate. The wood will dry and turn gray from the exposure to the sun's ultraviolet rays. After 3-12 months you would need to apply a wood cleaner to remove the gray wood cells. This can be done with scrubbing and or light pressure washing. After cleaning the deck you will need to neutralize the wood deck cleaner with a wood brightener. Let dry for 24-48 hours then apply your deck stain of choice. Stain New Deck Right Away. Not the most common approach but can be done if you prep properly. Apply a wood deck cleaner and thoroughly scrub and or pressure wash lightly. Neutralize with a wood brightener. These two steps will remove the mill glaze and "open" the wood pores. Apply a deck stain that is "thin" in viscosity. A heavily bodied wood stain will have a hard time penetrating into the new wood. Using a stain similar to The Sealer Store TimberOil will penetrate into the wood. Do not over apply a wood deck stain/sealer to a new deck. The excessive stain will not soak into the wood causing the finish to dry on top of the wood. Many manufacturers suggest only one coat on newly installed wood. If you have any about staining a brand new deck please ask below. All questions are typically answered within a day. We have had a new deck built this week. Ive been told I can use "new timber prep" to skip the wait time before applying the oil coat. Is this correct or should I still give it time? As the article states, you have to wait and prep. We just finished an Ipe deck that was started in August and are now about finished prepping and painting the cedar post wraps. We are in Virginia and the temperature is dropping and seems to rain all the time. The Ipe is weathering due to the length of time it has been exposed. Would it be better to wait to oil the wood in the spring or try to oil now if above 50 degrees. Even if it does not rain, the deck always gets wet over night so not sure we would be able to keep wood dry after oiling. Hi there, I hope you can help me out. Our new deck has been up since May, and now when it's ready to stain it's getting fairly chilly. Can I wait until spring, or should I try hard to get it done in the next few weeks when the weather is in the 50's for a few days at a time? Thanks! You could do either as long as the weather cooperates. I have new weather shield wood deck. It was completed in June. Some say stain, some say just put a sealer and I am confused. I wanted to use semi solid stain. I live in NY with cold weather. The sun beats on the deck. Any suggestions? Will it get weather beaten if I wait till Spring. You will need to wait a year and prep first. Hello! We have spent the last three summers rebuilding our very large old deck with new treated wood so some of it is two summers ago some of it was last summer and some of it installed just this summer. Is it my best option to lightly power wash the whole thing and apply one coat of stain now? All wood should be at least 3 months old. If so, prep with a deck cleaner and pressure washer. Brightening the wood after. One coat of the stain. Hi, I'm Betty from below. The installer of my new deck told me also to stain within a couple weeks because he said the method they use to create the pressure treated lumber is not as strong as it used to be and is not soaked in kreosote as it once was. Is this accurate that lumber is 'treated' differently now and so there could be a reason to stain earlier to keep it protected? If not, what could be the reason people are being told to stain earlier by installers? Cheap lumber??? No, he is wrong and does not understand how stain works on new wood. You must wait and prep. Deck was just installed, and the builder said we had to stain it within 30 days or his warranty would be void (2 year labor). Pressure treated pine is the material. This doesn't seem right to me, but can we really stain within a week of installation? Our schedule doesn't allow us to wait, it's either this weekend or not. Typically no, you cannot stain right away. I installed a deck 3 weeks ago and though I have read,(including this article) that I should wait 3-12 months, I still have concerns. Maybe,is my ignorance. The new deck has started to show longitudinal cracks along the grain. I am concern that by the time I get to seal and stain it those cracks will be as bad as the deck we replaced. I know some cracking is normal, but how much is normal. Yes, cracks are normal and even when you stain it, they will still happen. In other words, a deck stain will not stop them from forming. My new pressure treated deck is 3 weeks old but has a lot of mold spots coming to the surface. Once water applied soaks in the wood, I want to use a hose attached to a bleach house cleaner to remove the mold prior to staining. Is this a good idea on new wood? I don't see this method as being an option for cleaning. Is there a reason to not clean wood in this manner? It needs to season for 3+ months and then prepped. Use a deck cleaner (not bleach) and light pressure washing to prep. Brightener after. Bleach is bad for wood and you new to open the wood grain and remove the mill glaze as well. deck installed a couple years aga with treated boards. It has only weathered (not been touched) Must it be sanded before applying stain???? 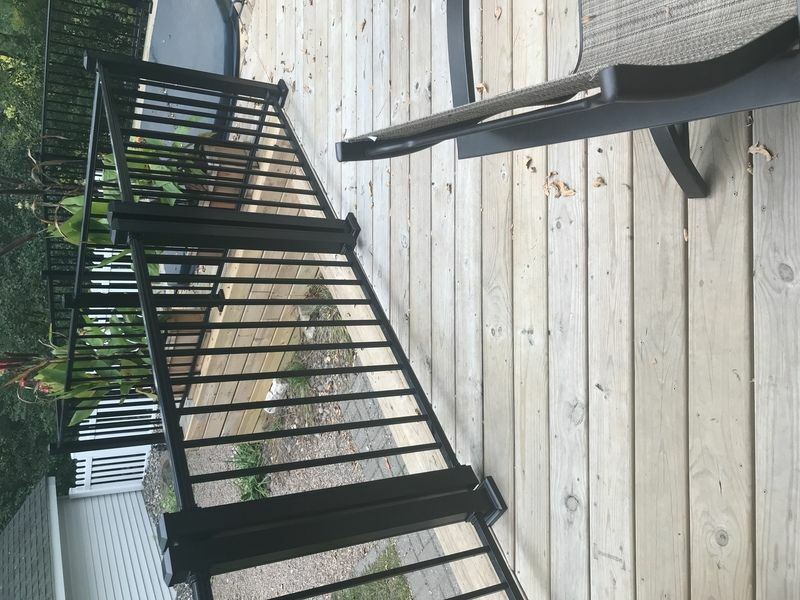 We are replacing our porch wood railing. We bought pre-fab railing panels from Menard's. Do we need to wait to stain these (or get the "mill glaze" off of them if we stain right away)? Second question - We used Behr solid stain last year. It peeled horribly (and not due to user error as far as we can tell). Is there any way to use a non-solid stain now? Yes you will need to wait and prep. You would have to power sand off the solid stain if you wanted to switch to a semi-transparent, etc. Just put in a new deck how long should we wait to stain it? The answer to this question is in the article above :) Always follow the directions of the stain brand you are using as well as it differs between brands. Can you wait too long to stain a deck? We have rental property in Pittsburgh PA where the temperatures can be harsh- snow in the winter and rain the rest of the year! We had a deck installed about 3 years ago. Scheduled a painter to come stain but he never showed nor answering messages. If we wait another year to get the deck stained will it damage the deck? Possibly. Best to do it this year if possible. I just had my pressure treated wood deck completed about a month ago. It’s been hot and the deck gets a lot of sun. It hasn’t changed to that gray color yet. Do I still need to use the cleaner and brightener before I stain/weatherproof? And do u think it would hurt anything if I waited till fall to do this so I don’t loose the deck for a week of my summer? Yes, you have to prep after the waiting period of 3-4 months. You will be fine to wait. We stripped and cleaned our deck this week, but forgot to use a wood brightener. Is is ok or too late to use it a few days later? Or does it not matter at this point since the deck has dried? Also, are 2 days enough wait to stain the deck after the brightener has been applied and rinsed, or should we wait longer after that last step? Thank you! Yes, you should still use the Brightener. 48 hours is correct. Thank you!! One last question, how long should we wait to move the furniture and planters etc. back onto the deck? Couple of days after the stain is applied. There are a few companies that claim to clean and "seal" your deck that lasts for 20 years. Is there any validity to this and if so do you carry any product like that to be used DIY? That is an impossibility and a gimmick. Don't fall for it. 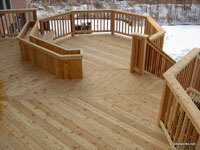 You will still need to stain the deck every 2-3 years with a deck stain if you used their product. Not very well nor would it look very good. You should always prep the wood before applying a stain. 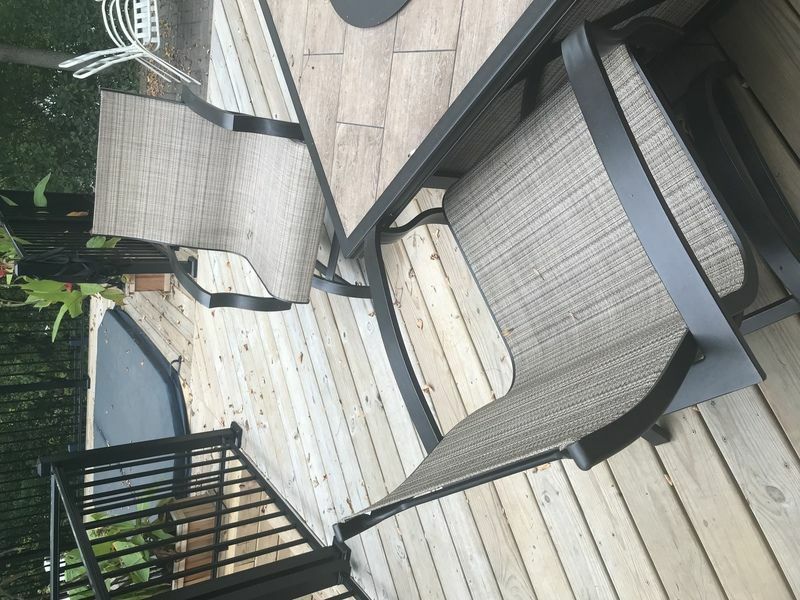 Is it necessary to seal a fully covered deck? Yes, seal and stain is best for maximum protection. We are in Prineville, Oregon and just had a Trex deck installed but the railing is made of fir, and the cap on the fir railing is made of cedar. Our current temps are Highs 40s and Lows 20s and heading into winter. I know we wouldn't be able to stain it now because of the low temps, but I'm worried that the winter weather will damage the wood before we are able to stain it in the Spring. So my question is, will the railing be damaged thru the winter weather? No. They will be fine.